Has Obama saved the once-maligned federal agency? It’s not exactly the Rapture, but the tornadoes that have been tearing through the Midwest and South this year certainly have an end-times feel to them. Just this past Sunday, an EF-5 level tornado (that’s as fierce as it gets) plowed through Joplin, Missouri, killing at least 125 people, flaying the bark off trees, crumpling cars like aluminum cans, and basically flattening everything in its six-mile path. 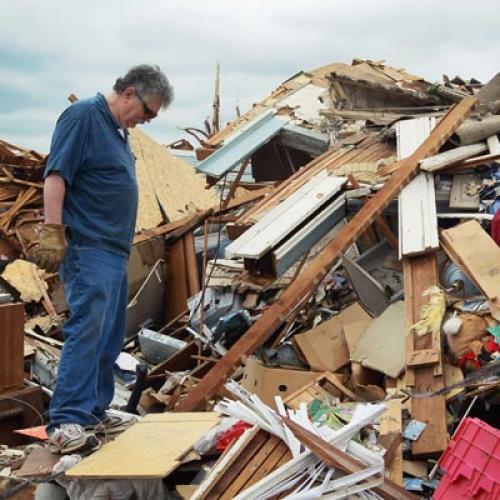 At last count, that brings this year’s tornado count up to nearly 1,000, leaving more than 480 dead—the worst twister season since 519 people died in 1953 (an era, note, before Doppler radar and early-warning systems became widespread). For now, the main political debate has been about whether climate change is responsible for this outburst. But that's probably not overly productive. As Weather Underground’s Jeff Masters notes, we simply don’t know: “It is either a fluke, the start of a new trend, or an early warning symptom that the climate is growing unstable and is transitioning to a new, higher energy state with the potential to create unprecedented weather and climate events. All are reasonable explanations, but we don’t have a long enough history of good tornado data to judge which is most likely to be correct.” It’s just way too early to try to make any grand pronouncements about these tornadoes. What’s not too early to ask, however, is how well the government is reacting to these disasters. Back in April, The New York Times sent a reporter down to Tuscaloosa, Alabama—a state where tornadoes have killed more than 250 people—and found that residents generally had upbeat things to say about the Federal Emergency Management Agency (FEMA), an agency that had been reviled for its bureaucratic bungling after Hurricane Katrina turned New Orleans into a fish tank. “It ain’t like Katrina,” said one homeless resident. “We’re getting help.” So has the Obama administration really turned FEMA around? For decades, FEMA was considered a dumping ground for unqualified appointees owed a favor. Heading up FEMA was sort of like heading up the embassy in Luxembourg (George H.W. Bush appointed his chief of staff’s next-door neighbor), and, as a 1995 Washington Monthly article by Daniel Franklin discovered, the agency historically had ten times the proportion of political appointees as other agencies. Worse still, up until the 1990s, most of FEMA’s budget went toward planning for the aftermath of a nuclear attack—natural disasters ranked low on the priority list. In 1992, after Hurricane Andrew smashed up the Florida coast and left 200,000 people homeless, FEMA took three days to respond and rarely instilled much confidence. As the Washington Monthly noted, FEMA officials sent down to do damage assessment arrived a week late and had no experience whatsoever. The Hurricane Andrew fiasco was shocking enough to prompt big changes. In 1993, Bill Clinton ended up appointing a head—James Lee Witt—who had actual emergency management experience back in Arkansas. Witt revamped the agency, hired qualified staffers, and shifted money away from preparing for nuclear Armageddon. The agency later won praise for its quick response to the Oklahoma City bombing in 1995. Even Republican Jim Inhofe, no fan of Clinton, hailed Witt’s performance. But those reforms didn’t last. In 2000, George W. Bush appointed Joe Allbaugh to head FEMA. Allbaugh didn’t have any disaster-management expertise, but he hadhelped run Bush’s campaign. Allbaugh soon testified before Congress that the federal government should scale back its disaster-planning efforts, and, after September 11, FEMA was folded into Homeland Security to focus on terrorism. In 2002, Allbaugh was succeeded by Michael Brown, whose main claim to fame was getting fired as attorney for the International Arabian Horse Association. Not surprisingly, FEMA’s performance during Katrina was a mess: As numerous news stories documented, the agency was slow to react to the crisis and took forever to get buses, water, fuel, and other supplies to affected areas. So what has Barack Obama done to make the agency better? To his credit, he appointed as head of FEMA Craig Fugate, who had actual relevant experience directing Florida’s emergency-management division. And there are early signs that the agency is improving. Back in 2003, the Partnership for Public Service, a nonprofit, began taking surveys of federal workers, asking questions about morale, whether they have adequate resources, and how able their leaders are. Max Stier, the CEO of Partnership for Public Service, told me that these metrics may not be perfect, but they correlate pretty well with performance in the private sector (many large companies conduct similar surveys to identify problem areas early on). Back in 2003, FEMA ranked dead last among agencies. “Just looking at that, there was a pretty good bet that, when a crisis hit, FEMA wouldn’t be able to deal with it,” says Stier. And now? Since Fugate was appointed, the agency’s scores have risen slightly, especially in employee assessments of the senior leadership. Disaster experts also note that there are a few key things FEMA has done right. After the Alabama tornadoes, for instance, the agency talked to White House officials about getting a federal emergency declaration ready even before Alabama made a formal request to do so. Historically, FEMA has waited for formal requests before mobilizing—a big cause of delays during Katrina. All in all, Obama would be shrewd to pay close attention to FEMA—and make sure the agency continues to improve. A recent paper in the American Journal of Political Science found that the electoral benefits of a competent response to natural disasters can be pretty significant and last for years. (Though, granted, the paper was studying the 2002 Elbe flooding in Germany, not the United States.) And, on the flip side, other political scientists have found that the weak response to Katrina did play some part in hurting the GOP’s presidential prospects. This is all worth noting—regardless of whether these tornadoes are a fluke or the first signs of further weather apocalypses to come. Bradford Plumer is associate editor of The New Republic.